Plains Exploration & Production (NYSE: PXP) reported earnings on Feb. 21. Here are the numbers you need to know. For the quarter ended Dec. 31 (Q4), Plains Exploration & Production beat expectations on revenues and missed estimates on earnings per share. Compared to the prior-year quarter, revenue increased significantly. Non-GAAP earnings per share grew significantly. GAAP earnings per share grew significantly. 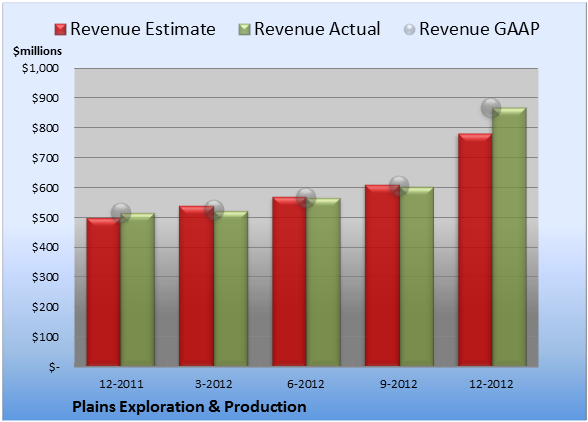 Plains Exploration & Production recorded revenue of $869.2 million. The six analysts polled by S&P Capital IQ wanted to see revenue of $782.4 million on the same basis. GAAP reported sales were 68% higher than the prior-year quarter's $517.5 million. EPS came in at $0.42. 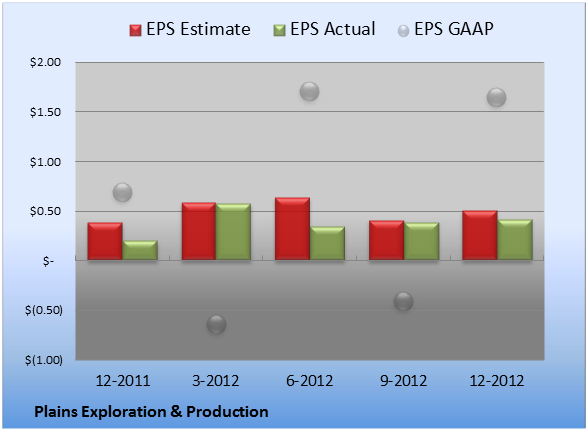 The 13 earnings estimates compiled by S&P Capital IQ forecast $0.51 per share. Non-GAAP EPS of $0.42 for Q4 were 110% higher than the prior-year quarter's $0.20 per share. GAAP EPS of $1.65 for Q4 were 139% higher than the prior-year quarter's $0.69 per share. For the quarter, gross margin was 78.0%, 910 basis points better than the prior-year quarter. Operating margin was 24.4%, 690 basis points better than the prior-year quarter. Net margin was 25.2%, 630 basis points better than the prior-year quarter. Next quarter's average estimate for revenue is $1.12 billion. On the bottom line, the average EPS estimate is $0.80. Next year's average estimate for revenue is $4.36 billion. The average EPS estimate is $2.38. The stock has a four-star rating (out of five) at Motley Fool CAPS, with 383 members out of 398 rating the stock outperform, and 15 members rating it underperform. Among 87 CAPS All-Star picks (recommendations by the highest-ranked CAPS members), 84 give Plains Exploration & Production a green thumbs-up, and three give it a red thumbs-down. Of Wall Street recommendations tracked by S&P Capital IQ, the average opinion on Plains Exploration & Production is hold, with an average price target of $47.45. Is Plains Exploration & Production the right energy stock for you? Read about a handful of timely, profit-producing plays on expensive crude in "3 Stocks for $100 Oil." Click here for instant access to this free report. Add Plains Exploration & Production to My Watchlist.